Your school must have signed up to use School Enews. Most parents and carers find out about School Enews from their school. ​If your school doesn't use School Enews yet, why not mention it to your school staff at a P&C / P&F meeting. Contact us if you require assistance or brochures. ​Schools use either the School Enews app or a custom app. Check instructions from your school. Download your school app and open it once downloaded. Note: Windows Phone and Windows devices... download School Enews app. Note: The next time your school sends a message, you should get an alert. Find the link on your school website to subscribe to receive email updates. 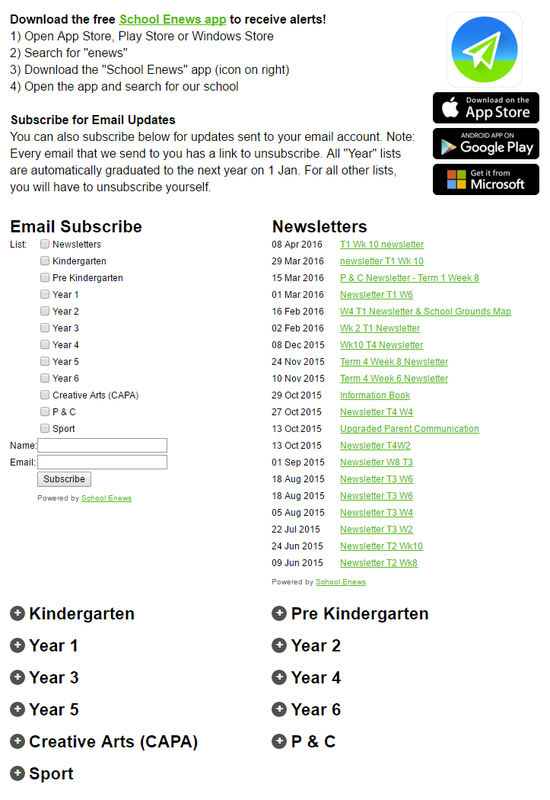 All newsletters, notes and alerts sent via School Enews are also displayed on your school's website. Go to your school website or search for your school website address in Google. ​Your school should have a web page that looks like this (on the right). This is the school website add-on offered by School Enews. This page automatically updates the school websites when a message is sent via School Enews. Note: If you can't find the link on your school's website, then please contact us support@schoolenews.com so we can assist your school in setting up a page like this. ​School Staff: See this page for instructions. ​1. I've changed my email address. What should I do? If you change your email address, then you should re-subscribe on your school's website. 2. I have tried unsubscribing but I am still receiving emails. What can I do? On all emails from your school there is a link to unsubscribe. You should first try clicking on this link. If this doesn't work for you, please contact your school (email or phone) and ask them to take you off their list. Your school has the ability to quickly search and manually delete email addresses. 3. I'm having trouble subscribing to receive the email from my school. What can I do? Please phone your school and ask them to manually add your email address to receive the newsletter. Your school can easily add in new email addresses. 4. I've received the email from my school, however, I can't open the attachment(s). Your school will send all attachments as a PDF file. You need to have the free "Adobe Acrobat Reader" software installed on your computer. Add the domain “schoolenews.com.au” and "schoolenews.com" to your email “whitelist” both on your computer and at the SERVER level – call your internet provider or Work Administrator about how to do this. Also add "noreply@schoolenews.com.au" and "noreply@schoolenews.com" to your address book. Try using a different email address (some ISP email accounts aren't as reliable as other free email accounts eg. gmail, hotmail, yahoo etc). Perhaps try using the app instead of email - the app is more reliable then email because School Enews controls more of the end-to-end processes ie. we are less reliant on other companies doing the right thing. Contact your ISP (internet service provider) or School Enews - send us your email address that isn't working. We are here to help. School Enews maintains a number of testing email address eg. name@gmail.com, name@y7mail.com, name@hotmail.com, name@iinet.net.au, name@live.com, name@outlook.com, name@bigpond.com etc. We frequently test to make sure that all of these email accounts are receiving email. We also monitor blacklists to make sure our server doesn't accidentally end up on these. Email is a decentralised system. This means that many parties are involved to make sure email works. Email not being received isn't necessarily the senders fault / issue. School Enews can't control the actions of other companies.